Plasma membranes envelop all plant and animal cells and all single-celled eukaryotes and prokaryotes , separating them from their environments. Structurally, they resemble other cellular membranes, but differ slightly in their lipid composition and more drastically in their protein content from one cell to another and from intracellular membranes. These compositional similarities and differences, in turn, are reflected in the ways in which plasma membranes carry out their functions, facilitating solute transport, conducting signals, and anchoring cells to their environments. Like other membranes, plasma membranes are essentially lipid bilayers and exhibit a dynamic organization and fluidity characteristic of such "liquid crystalline" structures. The predominant lipids found in most plasma membranes include phospholipid and glycolipid; those in animal cells also contain significant amounts of cholesterol. Since cholesterol is a stiff, planar molecule and is thought to have a stabilizing influence on plasma membranes, scientists speculate its presence represents an adaptation by animal cells to the absence of the external cell wall that surrounds bacterial and plant cells. Plasma membranes also contain protein and glycoprotein in addition to lipid, of both the integral and peripheral varieties. These proteins perform the major functions associated with plasma membrane and they account for the major differences in plasma membranes among different cells of an organism. 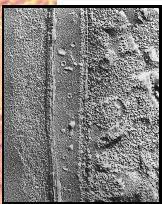 Freeze fracture image across the cell wall and membrane of a bluegreen algae. Plasma membranes transport nutrients into (and out of) cells and are responsible for facilitating the removal of carbon dioxide, the waste product of respiration. To perform these functions, they contain integral membrane proteins (IMP) that serve as carriers for glucose and a variety of amino acids and for HCO 3 >-(bicarbonate, the soluble form of carbon dioxide). All cells typically maintain cytoplasmic concentrations of Na + (sodium) and K + (potassium) at very different levels than found in their immediate environment: higher in the case of K + and lower in the case of Na + These ion gradients are maintained by another group of IMP called pumps, which actively transport these ions up their gradients, using energy supplied by metabolism . Membranes are also leaky to these ions, which diffuse across the plasma membrane and down their respective gradients through another class of IMPs called channels. Differences in the rates of ion diffusion produce differences in electrical charge across most membranes; these are measured as small differences in voltage and are called resting potentials. In so-called excitable cells, such as muscle fibers and neurons , channels may be opened by changes in resting potentials (or by signaling molecules binding to them). When this happens a wave of change in electrical potential may pass along the plasma membrane over the entire surface of the cell; these are called action potentials and represent the major way our nerves and sense organs communicate. Proteins integral to plasma membranes are involved in other forms of signaling as well. In these instances, an external signaling molecule, such as a hormone, binds very selectively to that portion of the IMP extending into the external environment (often involving the carbohydrates attached to the IMP). Such IMPs are more commonly called receptors, which differ in their binding specificity for various signaling molecules. When binding occurs, the receptor changes its overall structure (its conformation ) and that portion projecting into the cytoplasm becomes reactive in some manner. The cytoplasmic region might become an activated enzyme or it might, in turn, become "sticky" for a soluble cytoplasmic enzyme. In any event, the presence of an external signal is conveyed across the plasma membrane and is amplified by the activation of cytoplasmic enzymes, which continue the signaling process by producing second messengers. Under certain circumstances, the cytoplasmic "tails" of receptors are anchored to peripheral membrane protein components of the cytoskeleton , and the binding of a molecule to the extracellular surface releases the receptor from its anchorage. The IMP is then free to diffuse in the plane of the membrane and may become associated with other peripheral membrane proteins in the cytoplasm and aggregated into a specialized region of the plasma membrane called a coated pit. The coated pit then invaginates and forms a vesicle , by a process called endocytosis that removes the receptor (and its attached signal) from the cell surface. Integral membrane proteins of the plasma membranes also anchor cells to their environment: that is, to neighboring cells and to the proteins and glycoproteins of the extracellular environment (the extracellular matrix or ECM). The cytoplasmic portions of these IMP in turn are usually attached to peripheral membrane components of the cytoskeleton (such as microfilaments and intermediate filaments). Although these IMPs are not usually called receptors, their binding with the IMP of an adjacent cell or with the peripheral membrane proteins of the ECM is very selective, and a complex terminology has developed to characterize the very specific nature of these cell-cell and cell-matrix interactions and the IMP involved. 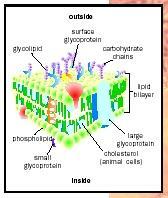 The plasma membrane is composed of a bilayer of phospholipid molecules, plus large numbers of embedded proteins, many of which have attached sugar molecules (glycoproteins). Animal cells also contain cholesterol, which increases rigidity. Anchoring IMPs also resemble receptors insofar as changes in cell-cell and cell-ECM interactions mediated by these IMPs are often associated with changes in the cytoplasmic regions of the IMP, in this case to their attachments with the cytoskeleton. In this manner, some cells move from place to place (by changing their anchorage points), either normally in the case of circulating leukocytes and abnormally in the case of metastasizing cancer cells. Clusters of anchoring IMPs and their cytoskeletal elements are often referred to as desmosomes when the associations involve other cells and hemidesmosomes when the clusters attach to the ECM. Certain intercellular IMP associations are so tight they effectively seal adjacent cells to each other (without causing fusion of their membranes), forming so-called tight junctions. Tight junctions are especially common in epithelial tissue where their presence in bands around all the epithelia cells produces a very effective barrier against leakage of materials across the tissue through the extracellular space. Finally, certain IMPs may self-associate to form large, nonselective channels in the plasma membrane; such channels arise in close association with identical channels in neighboring cells, establishing cytoplasmic continuity among the cells so connected. These junctions are called gap junctions and they are thought to represent a major means of communications among neighboring cells making up a specialized tissue. Receptors and anchoring IMPs, and the plasma membranes containing them, differ respectively in the signals they can receive, in the second messengers they produce and in the selective nature of their anchorages. To a lesser extent, this is true of transport IMPs as well. These IMPs are the products of differential gene activation and they thus represent a major way in which specialized cells differ from each other.